Preaching about Healing Ministry when invited. Supporting parish/deanery groups who are thinking about introducing healing ministry. Running an Introductory Course in a parish or deanery (please see below). Offering support meetings for existing ministry teams. In partnership with the Diocese running ALM Courses in the healing ministry (please see below). We offer an Introductory Course for all who wish to be involved in offering prayers for healing during Services in their Parish or Benefice. We are willing to come to a Parish or Benefice or Deanery to run a Couse at their invitation. All lay people who offer prayer ministry in public worship should undertake this training. The course could be run over a weekend or weekdays or over several evenings as is convenient for the Group. The course includes basic listening skills, the dos and don’ts in prayer ministry and….. In all our training we emphasise that Jesus Christ is the healer. 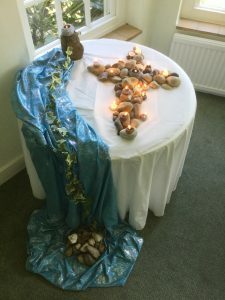 When people have undertaken the course and become active in a Healing Team then they are commissioned and issued with a Certificate that is signed jointly by their incumbent and the Diocesan Adviser in Healing and Wholeness. For those who wish to study more deeply about Healing and Wholeness it is possible to undertake this course. More details can be found on the Diocese of Canterbury’s website – https://www.canterburydiocese.org/alm/healing-and-wholeness/. All Diocesan ALM courses ask for attendance at a Deepening Discipleship Course first. People wanting to do this course are interviewed by the chaplain, and sponsored by their church leader and PCC.